If you run a large manufacturing or processing plant and you’re looking for a practical option for adding extra office space, you may want to consider a modular office. Modular offices are quick to install, cost-efficient and offer a plethora of benefits to managers, administrators, and staff who want to maximize efficiency by staying onsite for all communication purposes. Why Invest in a Modular Office System? Sometimes you’ll need a quiet space that’s right on-site. Not only does this allow managers and personnel to have a conversation in light of often-noisy floor activity, but it can also offer peace of mind in high-stress situations, during report-writing, or in the event of an emergency. Quick delivery and setup mean that you can get something delivered and installed onsite in a manner of days. Whether you’re on a construction site, or in a warehouse, event site or another type of large space, modular offices offer plenty of flexibility to build offices exactly where and how you need them. Productivity is critical in all areas of a warehouse or construction space, and communication must be clear. There won’t be a need for people to walk to the other end of the building — or even the block — to have a quick meeting. Not having to do so will save precious time and money. If you’re looking for more office space for meetings and more, a modular office system, or a modular outbuilding, is a perfect solution for hosting clients and visitors — here are a few of their many benefits. Think that modular in-plant offices are stuffy and noisy? Think again. Today we can include innovative heating and cooling systems that can help everyone in the vicinity to stay comfortable, happy, and working to their full potential. 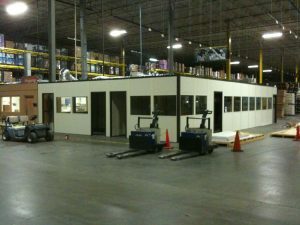 From site to warehouse, the portability of modular offices allows maximum flexibility for those who are shifting from place to place, and they adjust to meet different needs — for instance, by adding new walls or partitions. Our in-plant offices are custom designed and can include one modular wall or more to create the type of space that works best for your needs. 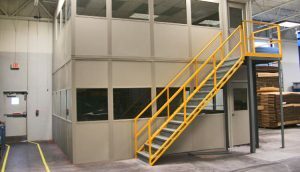 We also offer mezzanine style setups so that you aren’t taking up precious warehouse floor space. Materials used in modular buildings are purposefully light and durable, and they can be constructed in a matter of days. You’ll save time and money on labor and materials through a quick setup and portable design. Modular buildings are cheaper than traditional construction projects because they require fewer resources concerning materials and labor. They are reusable, and for tax purposes, they are essentially in the same class as furniture (rather than property), which means they can be depreciated as a capital cost over a shorter period of time. You may want to consider having your offices set up at height so that you can keep the floor in plain view. Our clients use in-plant office space as clean rooms, observation areas, and equipment storage. They can be especially useful when you’re routing visitors such as administrators and partners. In-plant modular offices with multiple rooms are also extremely useful when it comes to giving your hardworking staff and managers a quiet break or meeting area. Offices may also be stacked to two or three stories. BSC experts will help you figure out the best-fit modular office setup from start to finish. We’ll ensure that your space has all the specialized features you need, such as raceways, railings, and built-in storage components. We have decades of experience in storage systems, and our mission is to help you build a better business. Our mission is to give you and your employees with the strategies to become more productive and efficient so you can stay ahead of the competition. Whatever your unique requirements, we’ll find a custom solution that works for you. Because our designs are movable, we ensure maximum durability while offering the versatility that you and your personnel require to grow. Business Systems and Consultants is a leader in quality industrial storage, material handling, and modular office solutions. We are committed to outfitting our clients with modular offices and other storage solutions that meet the highest standards in innovation, safety, and quality. BSC has been offering outstanding service for over 40 years. Our experts will help you find the ideal industrial storage solutions for your needs. Want to learn more about our innovative solutions? Contact us today for more information.